Difficult alfalfa harvesting conditions sometimes result in farmers being off schedule for late summer harvesting alfalfa. This raises the question of best cutting management of alfalfa harvest as the end of summer approaches. be cut so late that the alfalfa does not regrow or use any root carbohydrates. This has resulted in the recommendation of a ‘no-cut’ window from Sept 1st to killing frost for Wisconsin. However, research in Quebec has helped define this window by indicating that alfalfa needs 500 growing degree days (GDD, [(maximum temperature – minimum temperature) ÷ 2] minus 41°F, accumulated until a killing frost of 24°F) after the last summer cutting to regrow sufficiently for good winter survival and yield the next year. Thus the date is not important but temperature following cutting and alfalfa regrowth. This means we can cut as late as 500 GDD will accumulate without hurting the winter survival. On the other extreme, we can also cut so late that little regrowth occurs. Cutting when 200 GDD or less will occur indicates that there will be insufficient regrowth to use significant amounts of root carbohydrates. These plants would also have good winter survival. It is important to remember that we do not need to wait for a killing frost to take the last cutting. We must only wait until it is so cool that little or no regrowth will occur. 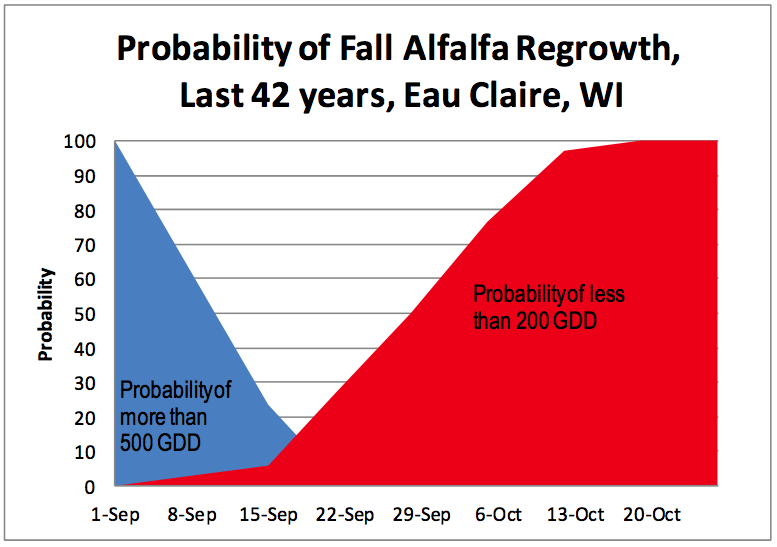 Thus harvesting in the late fall, when less than 200 GDD will accumulate, minimizes winter injury but, we should remember leaving the alfalfa residue improves overwintering of alfalfa since the reside provides some insulation of the alfalfa crown from cold air temperatures and helps hold snow with further insulates the crown. In summary, we want either to take the last alfalfa harvest early enough that regrowth and root replenishment occurs or so late that little to no growth occurs. Calculating both probabilities tells us the risk of winter injury or kill due to harvesting at different dates during September and October. This data was calculated for in Wisconsin sites where we had 42 years of weather history. In each graph, the blue is the probability of accumulating 500 GDD after each week. The maroon area is the probability of accumulating less than 200 GDD. So the top line is the probability of accumulating either 500 GDD or less than 200 GDD after the indicated date and shows the probability no injury or kill to alfalfa stands harvested on that date. We should assume that the graphs are for very winterhardy varieties (winter survival score of 2 or less) and that less winterhardy varieties would be at more risk. Optimum soil test levels of soil pH (6.5 or higher) and potassium can also enhance winter survival. 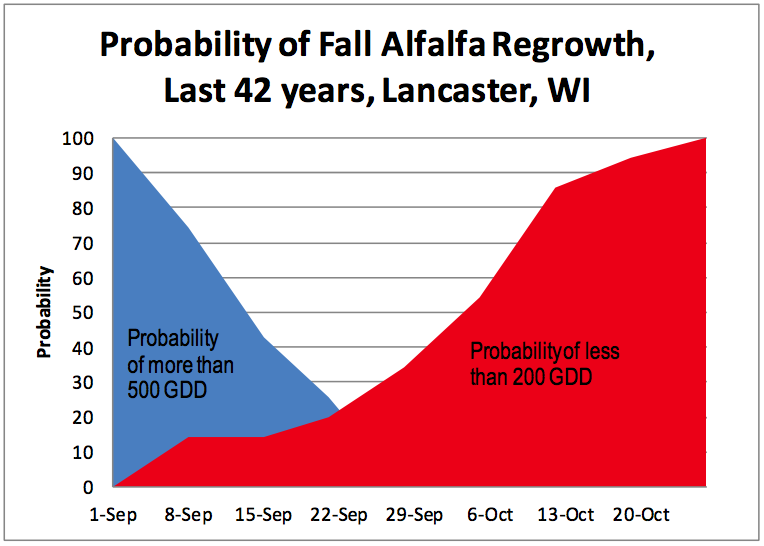 We can see that, at both Lancaster and Beloit 500 GDD or more always accumulated after September 1st. 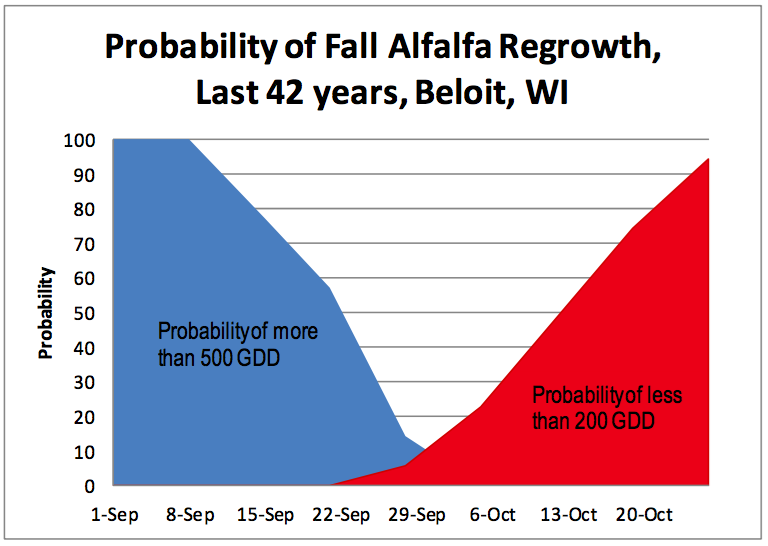 And while the probability remained 100% for 500 GDD or more at Beloit, it fell to 74% at Lancaster by Sept 8th. 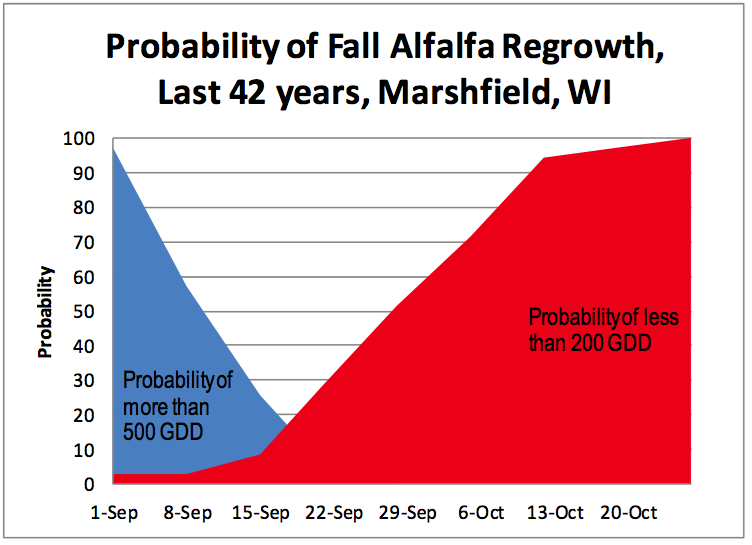 The middle of September through the middle of October was the riskiest time to cut alfalfa in southern Wisconsin over the last 42 years. At Eau Claire, Marshfield and Plymouth 100, 97 and 93 % of the time 500 GDD was accumulated after Sept 1st, respectively. 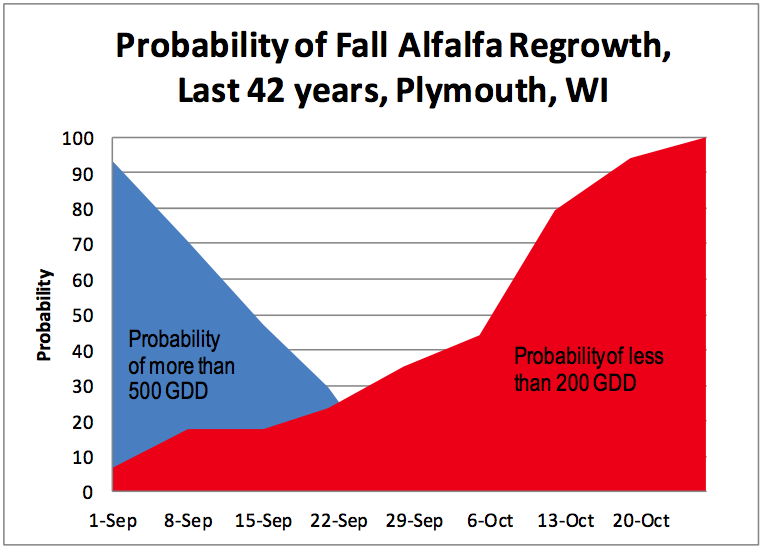 Probability of 500 GDD accumulation before a 25°F frost fell to about 60 to 70% one week later. Thus, not harvesting after Sept 1st is the safe alternative but often times being a week late was not detrimental. The last half of September was the riskiest with low probability of either more than 500 GDD or less than 200 GDD accumulation. Waiting till mid Oct was often safe whether or not a frost has occurred. Alfalfa forage quality changes little during September, so harvesting versus delaying harvest should be based on likelihood of winter injury or survival if the stand is to be kept. The effect of timing late summer cuttings on winter survival and next year yield depends on the weather following cutting and the graphs give the risk associated with cutting times over the last 42 years.